Thomas Jefferson did it. Steve Jobs did it. We are talking about cutting and pasting someone’s work. Before Steamboat Willie was a mouse, he was a person named Willie, dancing crazy. Walt made him into a cartoon mouse and eventually named it Mickey. Even this blog title, “What They Don’t Teach You At Business School” is a cut and paste of “What They Dont Teach You At HARVARD Business School” by Mark McCormack. It was a bestseller in 1983 and I am putting it back on the top 10 list Q4 of 2009. Heck, my book deal for “What They Don’t Teach You At Stanford Business School” is pretty much based on McCormack’s work — all I am doing is freshening up great content and getting rid of the Richard Nixon citations. In olden times, and up to the present, when artists wanted to learn how to paint, they started by copying the paintings of the masters who had come before them. Paintings are thought to be worth copying when all of the different elements are cohesive, belong together, support and enhance and balance each other, and create harmony and depth of feeling. In copying such great work of art, something of what makes that work of art work perfect is transmitted to the copier. An artist can study a painting by looking at it, reading about the artist’s life, and the time in which he/she lived, but those actions won’t reveal what is revealed through copying. It’s like an attunement between the two artists, the one who made the original and the one who copies, even if there are centuries in between them. The connection is bigger than the two individuals. It is mysterious and awesome and holy and timeless. The artist, as originator and copier, contains everything. He or she can channel anything because they believe they can. Through faith, practice, discipline, effort and grace, and most importantly humility, the artist bows before the work he copies. In olden times, and up to the present, when yogis wanted to reach enlightenment, they copied their teacher. They emulated what the teacher ate, how much they slept, when they meditated, what the nature of their thoughts were, how they showed kindness toward others, what holy books they read, what holy songs they sung, how equanimous they were in the midst of ups and downs, how saddened they were by the suffering of others, and how happy they were in the presence of the Lord. The yogi noticed how the great teacher harmonized with nature and the animals, how the great teacher’s voice was so soothing, and how the great teacher’s eyes sparkled. And if the yogi copied the lifestyle of the great teacher with humility and sincerity and a desire to serve, and if the yogi had no selfish motive, or at least yearned not to have a selfish motive, worked hard not year to year, or week to week, but minute to minute not to have a selfish motive, gradually the yogi and the great teacher would become one. Master Patanjali was one of the greatest yoga teachers, a master from olden times. He saw how to bring cohesion and harmony into the world. He knew how to channel the old masters all the way back to the oldest masters, and how to join hands with them. He knew how a human being could be useful in small ways and in big ways, practical ways and holy ways. “Imitation is the sincerest form of flattery”- My confessions #2 through #6 about cutting and pasting. 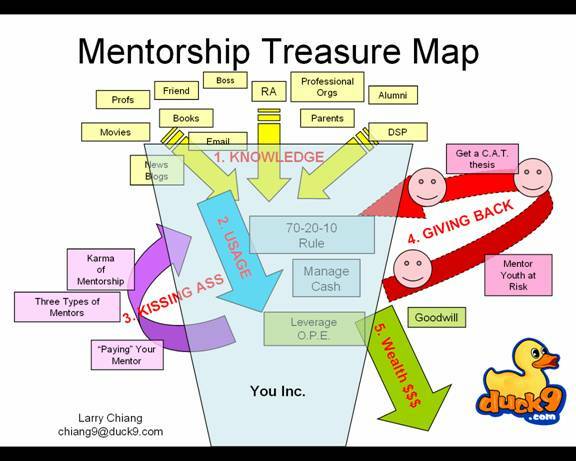 Confession #3: I copied the business model for United College Marketing Services from my first mentor, Grif Frost. He ran an international trading company and went to Thunderbird Graduate School of International Management. Confession #4: I cut and pasted Zumdahl’s twice (confession #2 was Thin File Analysis). It was so good that it springboarded me to speak at World Bank in Beijing . Right now, if you search the phrase “China Credit Bureau‘ you get my power point. Standing on a shoulder of a giant does make you taller. Confession #5. I cut and pasted Duck9 from a mentor that I met at Wharton: Doug Becker. He was CEO of Kaplan, a company that does SAT test preparation for students. I cut and pasted the phrase ‘SAT’ and replaced it with ‘FICO’. 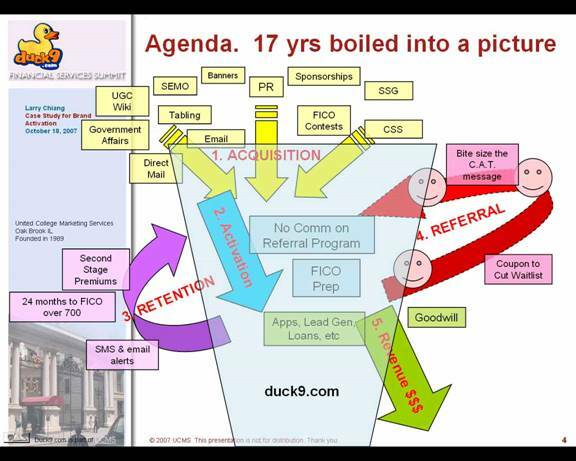 Duck9 does FICO score preparation for students to graduate them with a 750 or better. Confession #6. 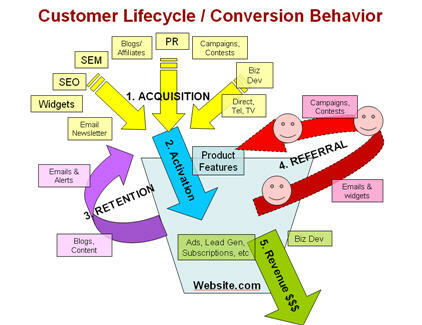 I cut and pasted Dave McClure’s “Customer Lifecycle” Map and turned into a “Lead Gen” Map for when I presented at iMedia’s Financial Marketing Conference. I’ve never been better complimented after a presentation (or more full of leads). Confession #7. I cut and pasted Scott Rafer Top 500 Feedster Blogs when I summarized Top 100 CreditCard.org blogs after I heard him present at Stanford’s VLAB. CONCLUSION: Copy stuff you think is genius. Copy me (verbatim is ok -I haven’t copyrighted) but better yet, copy my methods. He is a frequent contributor to Business Week’s blog on “What They Don’t Teach You at Business School“. For fun, writes in a journal, cooks on a hot plate and plays basketball on college campuses across America.